1. Trump's climate decision: President Trump will announce his decision on the Paris climate accord on Thursday. Trump is expected to withdraw from the landmark agreement, two senior U.S. officials familiar with his plans told CNN. Pulling out of the accord would trigger an exit process that could take four years. Corporate America is making a last ditch effort to pressure Trump to stay in the agreement. Tesla (TSLA) CEO Elon Musk, for example, has told Trump he will quit as an adviser if the president bails out of the deal. Trump will announce his decision in the White House Rose Garden at 3 p.m. ET. 2. Oil prices up: Oil prices climbed 1.3% Thursday after data from the American Petroleum Institute showed U.S. crude inventories fell last week. Investors are keeping a close eye on U.S. production after OPEC and other major producers decided to extend their production cut agreement last week for nine additional months. OPEC hopes the deal will help balance the market and push prices higher. However, if U.S. production continues to rise, the deal might not have the intended effect. More data on crude inventories will be published by the U.S. Energy Information Administration at 10:30 a.m.
3. Jobs data: Investors will also get a peek at the state of the U.S. labor market on Thursday. A report from ADP on private sector employment is expected to show that businesses created fewer than 200,000 jobs in May. Weekly unemployment claims are also due. The main event is Friday: That's when the U.S. jobs report for May will be released. 4. 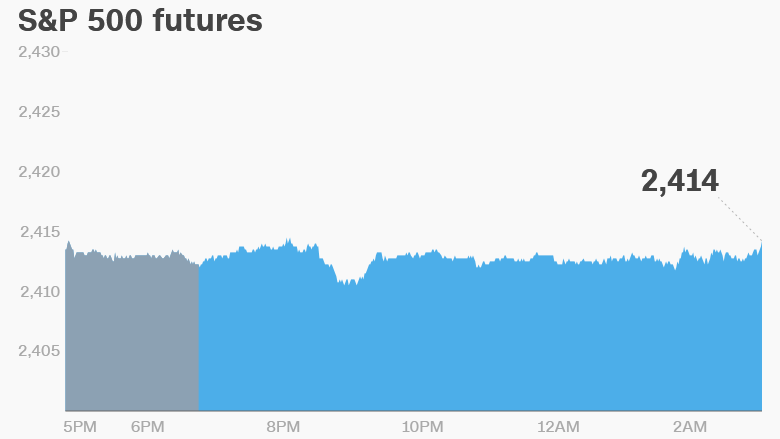 Market overview: U.S. stock futures were higher early Thursday. European markets opened higher. Asian markets ended the session mixed, with markets in mainland China losing ground while indexes in Tokyo and Hong Kong posted gains. The Dow Jones industrial average closed 0.1% down Wednesday. The S&P 500 and the Nasdaq both shed 0.1%. China's yuan jumped to its highest level since Trump's election on Thursday, its biggest one-day jump in five months. Analysts said the move was an attempt by Beijing to strengthen the currency following a credit rating downgrade by Moody's. 5. Stock market movers -- Marathon Petroleum; Hewlett Packard Enterprise: Marathon Petroleum (MPC) was up in extended trading after its board approved a $3 billion share buyback. Hewlett Packard Enterprise (HPE) lost ground after the company reported disappointing results on Wednesday. 6. Earnings and economics: Dollar General (DG) and Express (EXPR) are set to release earnings before the open Thursday, while Lululemon Athletica (LULU) will post results after the close. The Institute for Supply Management will release its U.S. manufacturing index at 10 a.m. Car sales data for May will also be reported on Thursday. Data on Chinese manufacturing released Thursday indicated the country's massive factory sector is losing momentum. The Caixin manufacturing PMI index fell below 50 for the first time since June 2016 to 49.6. Official data released Wednesday painted a rosier picture.